← Regency Nursing Throws Centenarian Birthday Bash!! Regency Nursing & Rehabilitation Centers and Facilities in New Jersey, has garnered a well deserved reputation for the compassionate and dedicated treatment of their Alzheimer patients. Regency combines a holistic and rigorous approach to care, while infusing love and laughter into the lives of their patients and residents! Regency Nursing – Where The Caring Comes To Life! Alzheimer’s is a disease that attacks brain cells and results in impaired memory, thinking and behavior. Scientists are still not certain what causes Alzheimer’s. Family history and age have been identified as potential factors, however it is likely that a number of things contribute to it. Although there is no known cure for the disease, each year researchers are uncovering more clues and developing treatment options. Medication and non-drug therapies are available to reduce some behavioral symptoms such as depression, sleeplessness and agitation. 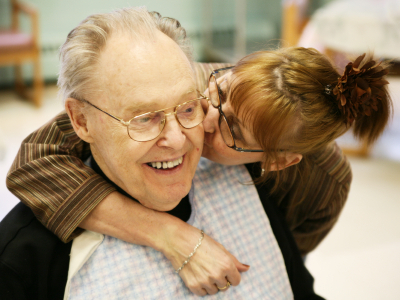 A skilled nursing setting, provides the Alzheimer patient with compassionate and quality medical care. Resident rooms may be private or shared and some settings may have special units or wings that cater exclusively for persons with dementia. The number of staff to resident ratio will be different from place to place, as will the knowledge and training of staff in caring for a perosn with the disease. Regulated and licensed by the state and/or federal government, most skilled nursing facilities provide specific structured activities programs for their Alzheimer patients. Upon admission into a skilled nursing home, the Alzheimer patient will be assessed. While encouraged to function at maximum abilities, they will not be expected to perform skills that they are no longer capable of. Settings of this type are appropriate for people with middle, late and end stages of the disease. This entry was posted in Senior Care and tagged alzheimer patient care, alzheimers care, best nj nursing homes for alzheimers, caring for alzheimer patients, new jersey nursing homes for alzheimer's, nj nursing homes for alzheimers, regency nursing nj, regencynursing.com, skilled nursing for alzheimers, www.regencynursing.com. Bookmark the permalink.